Everton come from behind to take all three points at West Brom. McAuley gave West Brom the lead just before 10 minutes, but Kevin Mirallas equalised in first half stoppage time before Gareth Barry headed in the winner to give Ronald Koeman his first league victory as Everton manager and to also end a torrid run in which Everton had lost their last 10 games in all competitions when their opponents scored first. Ronald Koeman opted to name the same starting 11 as the team that drew 1-1 with Spurs. Sporting the newly unveiled third kit, Ronald Koeman went with the same starting line-up as faced Tottenham as the Blues began their away campaign at the highest ground in the UK, the Hawthorns. Everton lined up: Stekelenburg, Baines, Funes Mori, Jagielka, Holgate, Barry, Gana Gueye, McCarthy, Mirallas, Barkley and Deulofeu, with a very strong bench that included new signings Ashley Williams and Yannick Bolasie together with Romelu Lukaku, Aaron Lennon, Bryan Oviedo and Tom Cleverley. Tony Pulis lined his Albion side up in a 4-4-2 formation: Foster in goal; Dawson, McAuley, Olsson, Evans as the back line; Phillips, Fletcher, Yacob, Gardner in the midfield with Berahino and Rondon as the dual strike force. Everton seemed to settle quickly with Deulofeu in the same free role up front as last week and Gareth Barry in charge of the middle of the park. And it was a great through ball from the veteran midfielder that nearly brought the first meaningful shot as Gerard tried to set up Ross who was tackled and the danger cleared. Albion took the lead slightly against the run of play on nine minutes as RFM failed to deal adequately with Rondon forcing Stekelenburg into conceding a corner. Gardner swung it in to the back post where McAuley climbed highest for an annoyingly simple – and all too familiar – back post header. Everton were having far more possession without unduly worrying the home defence and Foster made his first save from a Barry side-footer. Barry was in the thick of things and suffered an ugly looking challenge from Berahino that saw the Albion forward quite rightly booked by referee Neil Swarbrick. Ronald Koeman was spot on in making an early tactical change when he withdrew James McCarthy from the right side of the midfield on 37 minutes in favour of fit-again Romelu Lukaku so as to give the forward line a focal point. And the switch paid dividends in first half stoppage time as with West Brom marshalling the big Belgian, Everton put together a move of precision passing started by Mirallas. He found Gareth Barry, he found Ross and his return into the path of Kevin Mirallas was dispatched for a 1-1 half-time score line. West Brom nearly regained the lead in the opening minutes of the second half as a poor clearance from RFM cannoned into the path of Fletcher who’d escaped Baines and Maarten Stekelenburg did well to save with his legs. 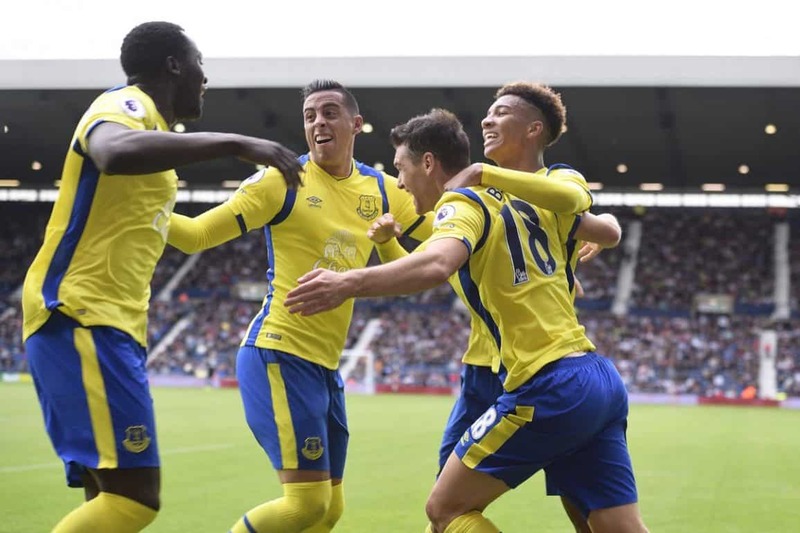 Everton responded with another surging rush forward by Mason Holgate and he forced a corner after a neat interchange of passes with Deulofeu and Lukaku. Gerard was denied at the back post and the home side cleared the second corner kick. A somewhat rash challenge by Jags led to an Albion free kick just outside the penalty area, but Gardner curled it a yard wide. Olsson was booked for a foul on Mirallas and from the free kick RFM sent in a superb header that Foster turned away for a corner… and the Blues capitalised, taking the lead as Gareth Barry bravely finished at the back post from a Holgate mishit on the hour mark. Ronald Koeman immediately made a second change as he gave Yannick Bolasie his debut replacing the mercurial Deulofeu while Pulis made a double change three minutes later bringing on McClean and Leko from Gardner and Phillips respectively. Having taken the lead, Everton looked much better for it and with Kevin Mirallas resurgent on the left flank and roared on by the usual sold-out travelling support, they looked to stamp some authority on the game. And it should have been 3-1 when a right flank cross from Yannick Bolasie was headed just wide by Ross when it seemed easier to score. No Tony Pulis side simply lies down though and the Baggies almost inevitably looked for a more direct approach as the game entered the final quarter hour with ex-RS forward Rickie Lambert replacing Berahino. A good challenge by RFM denied Lambert from a McClean cross and Ronald Koeman reacted to the introduction of Lambert by bringing on Ashley Williams for Mirallas to help shore up the defence. The Welsh captain took up station between Jags on the right and RFM on the left with Baines and Holgate operating as defensive wingbacks ready to break forward given the chance. Everton really should have put the game to bed as a break saw a marvellous pass from Ross set Bolasie free and he unselfishly fed Lukaku whose first time effort was denied by Foster. Albion countered quickly and it took superb defending from Jags to deny McClean. With four additional minutes signalled, Mason Holgate again pushed forward to link with Ross and Rom, but Foster wasn’t unduly tested by a weak Lukaku shot. Evans brought down Bolasie and was booked for his transgression and a hand ball against Holgate gave the home side a last-ditch chance that saw Foster swing the last kick of the game wide. Not the most polished performance from Everton it has to be said, but three points is three points and the tactical awareness and willingness of Ronald Koeman to change things quicker than we’ve been used too proved the difference. The introduction of Romelu Lukaku gave the home side something to think about and in so doing, opened up space for Kevin Mirallas to exploit. Yeovil up next in the League Cup, see you Tuesday.